I have waited so long for this book. Ever since I read Claire's first book. Which I fell in love with. And then her second book. Which I fell in love with again. And then I heard of Winterspell. Which would be a young adult book. With kissing. And the wait has killed me. But now I have gotten to read it. And I have loved it. It was well worth the wait. Even more than worth it. I am not sure how to begin describing my love for this book. I waited so long to read it. And then now I finally got to read it via Edelweiss. I cannot tell you how happy that made me. How happy this book made me. Okay, it made me all kinds of sad and a little bit angry too. But every feeling made me love it more. Winterspell was a stunning book. I loved it so much. The book is told from the point of view of Clara. And oh. I'm not sure how to describe her. I loved her so much. But in the beginning of this book. She has such low thoughts about herself. About how she should deal with things. With Dr. Victor. And oh, how it broke my heart. But I also understood her so well. But yes. It was painful to read about. Especially with how awful Dr. Victor was. It creeped me out. Yet it was amazing to read about, because it seemed so real in a way. Which I loved. There are a lot of things in the beginning of this book. Like Clara's family. Her twelve year old sister. I loved reading about her, though there isn't that much about her. And their father. Ack. I can't decide what to feel about him. I think I pity him. But I do wish he had done more. Then. Her Godfather. I can't. I liked and disliked him. I can't talk too much about the plot in this book. Because I don't want to. I was surprised so many times in this book. And I loved it to pieces. I want all of you to feel the same way. Though I will talk a little about the romance, hih. But first. There is so much happening in this book. So many amazing things. The plot is truly stunning. I loved reading about everything. The time period. The other world. Reading about Cane was amazing. It was awful. All the poor people. It was heartbreaking. I loved every moment. There are so many characters in this book. I cannot name them all. First there is Nicholas. The cursed prince. And oh. I really truly loved him. Sigh. I loved the romance between him and Clara. Though it did take forever to happen. And it wasn't all that much of it. But what there is? It is perfect. It is full of tension and some steamy scenes. It is full of longing. Some heartbreak. Some betrayal. Nicholas do stupid things. But I can't truly dislike him for them. But yes. The romance is amazing in Winterspell. Some other amazing people in this book. Young Bo. She was so cute. Yet some things about her broke my heart. Sniffs. But I loved reading about her so much, as she was awesome. Then there is the faery queen, Anise. I can't decide how I feel about her. I hate what she did to Nicholas's kingdom. His family. How she cursed him. His curse was so interesting. And so heartbreaking. Sobs. Anyway. I liked her sometimes. Most of the time I disliked her. How she and Clara were together confused me a little. 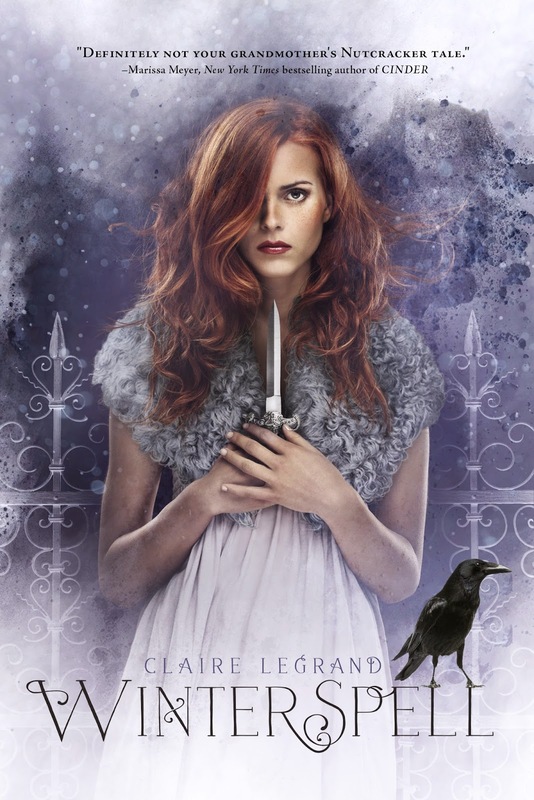 You should all know by now how much I adore Claire Legrand. First, she is an amazing person. So kind and sweet and just all kinds of awesome. I adore her so much. Then there are her books. The Cavendish Home for Boys and Girls. Already read it three times, and I will never tire of it. It is beyond stunning. As is her other middle grade book, The Year of Shadows. Which I must re-read pretty soon. I cannot wait. And now there is Winterspell. Which I love most of all. Such a spellbinding book. So much beauty. I need you all to buy Winterspell when it comes out in late September. Because it truly is a stunning book. I loved it to pieces. And I think all of you will too. And seriously. That cover? Who would not want to own it? Sigh. So gorgeous. I cannot wait to get my hardcovers in September. And I also cannot wait to read Winterspell again. Because it was such a beautiful book. Full of pain. Full of hope. Full of romance and betrayals. This book had it all. And I'm so glad I finally got to read it. It will always be special to me. Oh I love this cover and now I am super excited to read the book! YESSSSSSSSSSSSS!! SO SO HAPPY TO HEAR YOU LOVED THIS ONE!! I'm pretty much sure I'm gonna skip my TBR list and read this one super soon! LOL my first thought when it comes to the nutcracker is the Barbie movie too! Hah it *was* a great movie. I also saw a ballet later. I've always been interested in the story of the nutcracker and I love the cover of this one so I'm glad it's a good story! Clara sounds great and I'm so excited to read it! YOU GOT IT! And you loved it! :D YAY! I rerequested it, so maybe I'll get it now, too. I'm so glad that you loved it; it sounds so gorgeous. :) Great review Carina! Yay, glad you loved it! Have to admit that I'm a bit scared about the ending now, though...is it sad? .... I am worried about the ending Carina .-. I love my HEAs and... its so much harder to deal with (what sounds like a?) bittersweet ending in a fairy tale re-telling (since I am huge Disney fan). I got rejected on EW and was going to request again and I STILL want to but a part of me is so afraid.. I think I may have to ask you for spoilers (as a general whether the couple get together or not way) if you don't mind .-. Awesome you make this one sound SO good so now I'm even MORE excited to read it! Actually, I really love what you have to say on behalf of Claire Legrand's other books as well, so I should really get to those reads too! I have a really good feeling I'll love them too. Nicely reviewed, Carina! I LOVE how it is a retelling from the Nutcracker :D I don't think I've ever seen a retelling from that fairy tale before and I used to love that story. It's a shame I was declined, so I have to wait a little longer, but it seems like this book is worth the wait!